The holiday season is upon us yet again, so of course here at Zweigle’s we’re in the kitchen experimenting with some of our favorite seasonal recipes. We love to put a spin on classic holiday dishes, so today we’re taking a traditional party appetizer and making it our own. We know you’ll love the ease of another slow cooker recipe, but you won’t be disappointed by the flavor of this dish either. Don’t believe us? Just give it a try for yourself! This recipe makes 15 mini hot dog bites. If more people want in on the deliciousness, simply multiply the ingredients for larger parties. 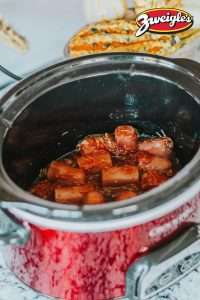 Cut hot dogs into thirds, and place in slow cooker. Add all other ingredients, stir, and let cook for four hours.